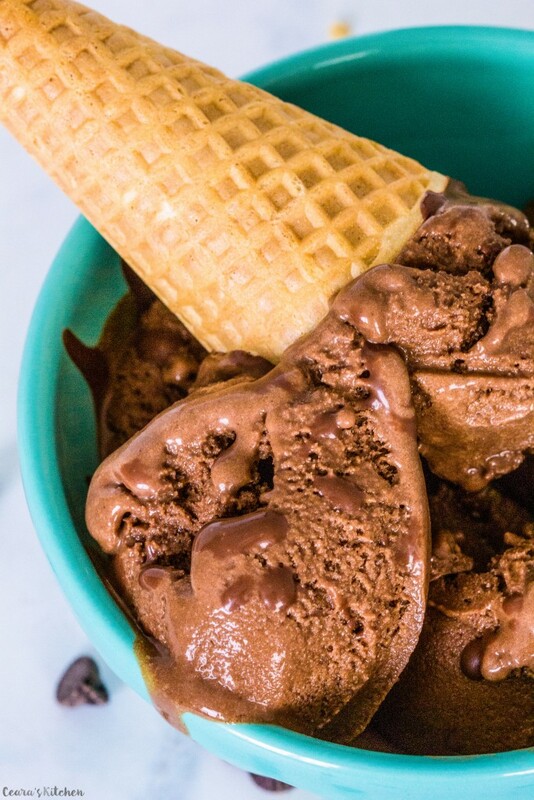 Rich and decadent Vegan Chocolate Ice Cream made with only a handful of ingredients. Who knew making ice cream at home was so easy (and soooo good!)? Do you own an ice cream maker? Okay, if I knew that homemade ice cream was so incredibly easy to make, I would’ve started making it ages ago. I actually borrowed by mom’s ice cream maker to make sure it’s an appliance I actually need. J and I moved into our new apartment in Toronto early March (and back to Canada last September) and my new kitchen is already splitting at the seams with kitchen gadgets and appliances. After a couple weeks of ice cream making, I’m convinced an ice cream maker is definitely worth the investment. 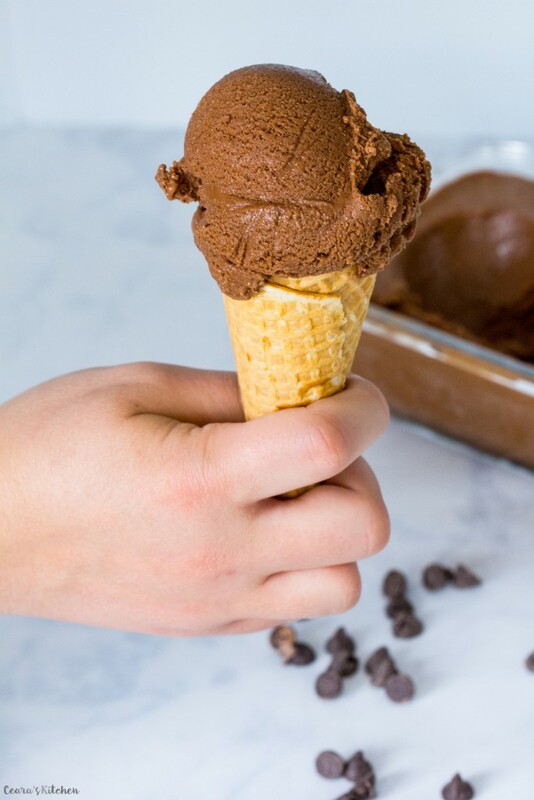 I mean look at that silky, creamy, fluffy and superrr chocolatey Vegan Chocolate Ice Cream. Just heavenly. One thing I never do in my recipes is skimp on the chocolate. Because it’s good for you, my partner J is Belgian, and I’m a chocoholic. I used cacao powder in this Vegan Chocolate Ice Cream but a high-quality cocoa powder also works great. Cacao powder is a bit more expensive than cocoa powder but it is slightly less refined and the chocolate flavor is so just oh-so-rich and decadent. I love using it when I bake and it worked like magic in this homemade ice cream. 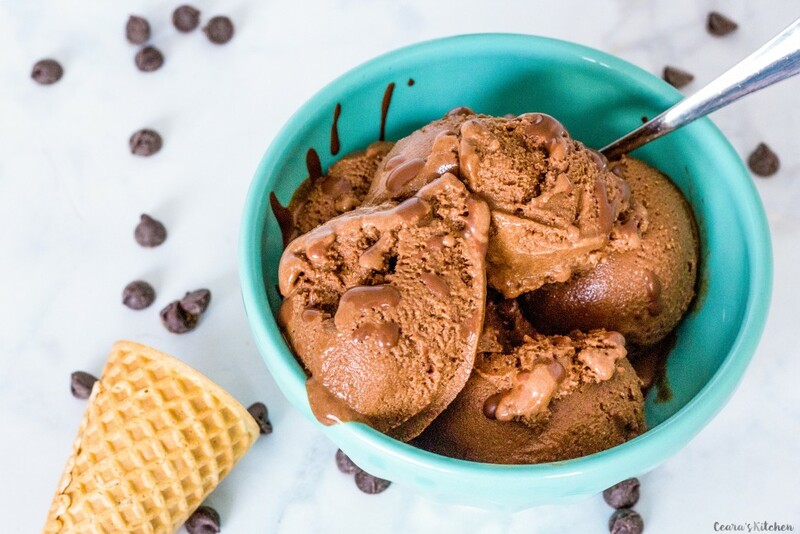 This Vegan Chocolate Ice Cream uses a few simple ingredients and is so easy to whip up you’ll wonder why you ever bothered with store-bought (and spending 9 dollars for a tub of vegan ice cream at the store!). 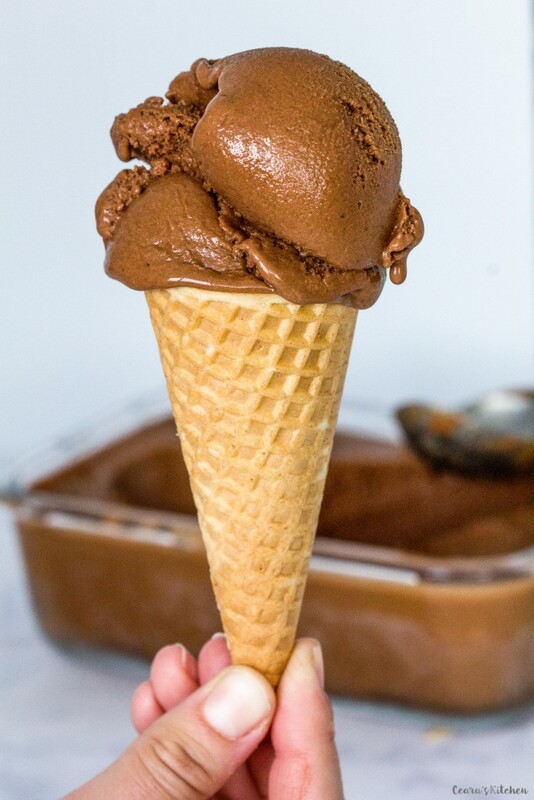 And I LOVE hearing your feedback and seeing your lovely photos guys – if you make this Vegan Chocolate Ice Cream at home, snap a photo and tag me #CearasKitchen on Instagram. 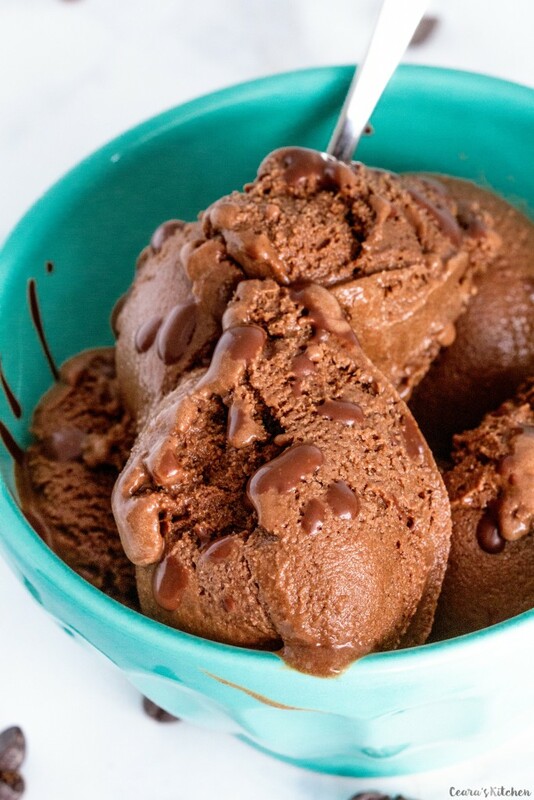 Rich and decadent Vegan Chocolate Ice Cream made with only a handful of ingredients – so incredibly silky and creamy you’ll wonder why you ever bothered with store bought! In a small bowl, mix together tapioca starch with 1/4 cup of the coconut milk until smooth. Warm the rest of the ingredients in a large pan (coconut milk, vanilla extract, cacao powder, coffee, sea salt, cane sugar, and maple syrup). Whisk over medium heat until the mixture starts to lightly simmer. Add the tapioca starch mixture and whisk until the mixtures begins to thicken (about 5 minutes). 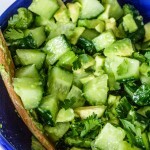 Pour mixture into a bowl and cover. 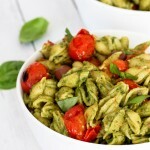 Leave to cool in the fridge overnight or for an hour in the freezer. The ice cream mixture should be completely cool before mixing it in the ice cream maker. Add the mixture to your (frozen – see note) ice cream maker and mix for about 20-30 minutes until your ice cream turns into a soft serve consistency. Do not over-mix (if you notice your ice cream has begun to melt it is time to freeze it) or else your ice cream will become icy and will not be as creamy. Scoop ice cream into a glass dish (or loaf pan lined with parchment paper), cover and freeze for an hour or two until the ice cream is completely frozen. Scoop onto an ice cream cone, cover with chocolate sauce and enjoy! I want to try this. I’m dairy intolerant and I’m allergic to coffee so I will leave out the coffee! Hopefully, it will be awesome anyway. Also, do you think it can be made without an ice cream freezer? Mine stopped working 9 years ago. It’s 110 heat index here today. This looks perfect! Hi Ceara, can i you Xanthan gum instead of tapioca starch and if yes then how do i use it? Can you taste the coffee in this ice cream? And if so can you skip it? The coffee brings out the “chocolate” flavor in the ice cream, you cannot taste it in the final recipe. Could I sub tapioca starch with arrowroot? This ice cream looks delicious! Is that 3/4 ‘cup’ cacao powder? i DO BELIEVE IT’S TIME TO MAKE SOME ICE CREAM! !